Christ The King Sunday concludes the church year. 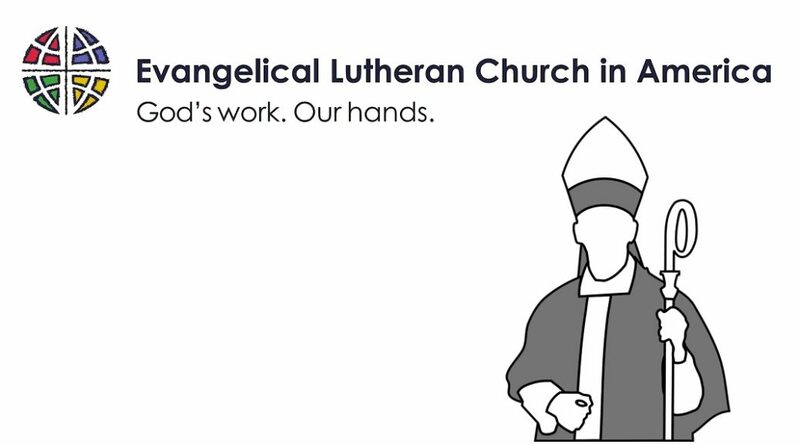 This is the time for the Gethsemane community to look to the past giving thanks for faithful stewards and look to the future encouraging every person within the Gethsemane Lutheran community to make a pledge commitment for 2017 ministries. the 3rd Annual Viola’s Bake-Off for all ages! Please come and share in this time celebrating ministries of the congregation and renewing commitment to 2017 ministry. Everyone is needed! Everyone has talents, time and treasure for ministry. 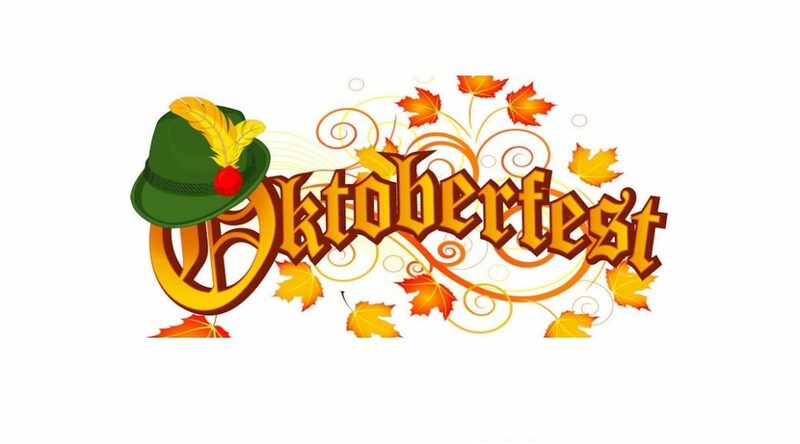 Gethsemane member Tony Venza, congregational representative to the Drive a Senior –North Central Austin, invites Gethsemane members and friends to the annual “Oktoberfest” fundraiser Thursday, October 13, 5 p.m.-8 p.m. at UUC of Austin 4700 Grover Ave.
Gethsemane is a charter member of Drive a Senior: Faith in Action Network. This senior adult ministry assists Austin residents to stay in their homes during the aging process by providing transportation to medical and other appointments without charge to the senior. Gethsemane Women of the Evangelical Lutheran Church in America Quilters have donated one of their beautiful quilts. Thanks to Tony Venza and previous Gethsemane Board Members Ria Corbett, Gloria Cooper and the late Herb Zipperian. Tuesday, October 4th is the commemoration day for St. Francis of Assisi, renewer of the church, 1226. Plans are being developed by the Frances Jonan, SPCA Director, Sarah Hammel, Katelen Knef, Shelter Managers Austin Humane Society and Pastor Karl Gronberg for the annual blessing of the animals. This blessing affirms the decades long partnership between Gethsemane Lutheran and the Austin Humane Society. Pastor and Dar Krenek along with classes from the Gethsemane Lutheran Children’s Ministry plan to tour the SPCA building as the dogs and cats are blessed. 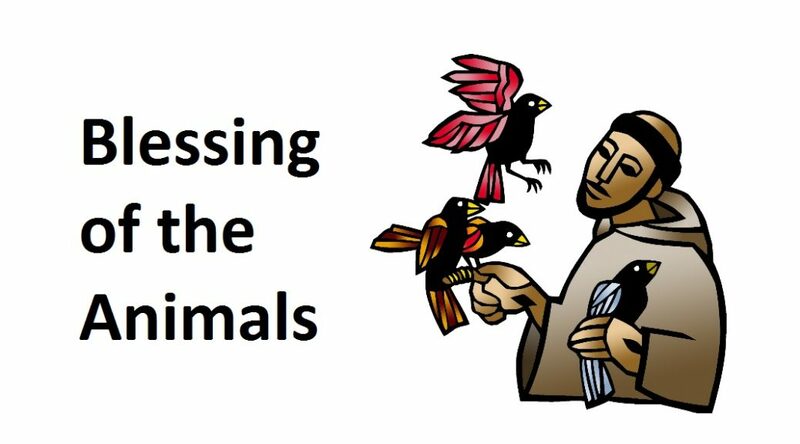 Two volunteers from the SPCA/Austin Humane Society will join Gethsemane congregants in worship October 2nd bringing with them “friends” to receive a blessing during the Children’s Time on St. Francis Sunday, October 2nd. Gethsemane gives thanks for the partnership shared with the SPCA/Austin Humane Society. Rev. Erik Karl Joseph Gronberg, a son of Gethsemane Lutheran, Austin will be installed as Bishop of the Northern Texas-Northern Louisiana Synod, Evangelical Lutheran Church in America Saturday, 10 a.m. September 17, 2016. ELCA Presiding Bishop Elizabeth Eaton will preach and preside. The installation is hosted by First Presbyterian Church 1000 Penn St., Fort Worth, Texas. Pastor Gronberg was baptized at Gethsemane by the beloved late Gethsemane pastor the Rev. Willis Erickson. He affirmed his baptism in the Rite of Confirmation and was ordained into the Word and Sacrament ministry of the Evangelical Lutheran Church in America at Gethsemane Lutheran. Erik is a graduate of Gethsemane Lutheran Children’s Ministry, (Good Beginnings Never End); AISD schools: Maplewood Elementary, Keeling Middle School, Reagan High; Harvard University Cambridge, Massachusetts; Luther Seminary St. Paul, Minnesota. Erik is a Ph.D candidate at Dallas Baptist University. He has served Martin Luther Lutheran Church, Oconomowoc, Wisconsin and Trinity Lutheran Ft. Worth, Texas. Gethsemane congregants may contact Pastor Karl or Sharon Gronberg for installation information. Thank you Gethsemane Lutheran for giving witness to the heritage and faith of the church community, to Erik and all called to serve the Evangelical Lutheran Church in America. Sunday, September 11th is Kick-Off for the Sunday morning and Wednesday evening Educational opportunities (Sept. 21st) at Gethsemane. All ages will gather in the MPR at 9:30 a.m. to celebrate the beginning of a new year of growing in faith together. After the opening, children and youth will go downstairs to meet with their teachers. Parents are asked to go with them to get them registered. Following the 10:30 a.m. worship, a delicious BBQ lunch prepared by Gethsemane members Greg & Debbie Pitts (aka Rusted Shut BBQ) and Gethsemane Men-in-Mission. The afternoon of Sept. 11 is an opportunity for Gethsemane congregants to reaffirm ministry to the neighborhood. This will be an multi-generational opportunity for service work restoring/reconciling communities. 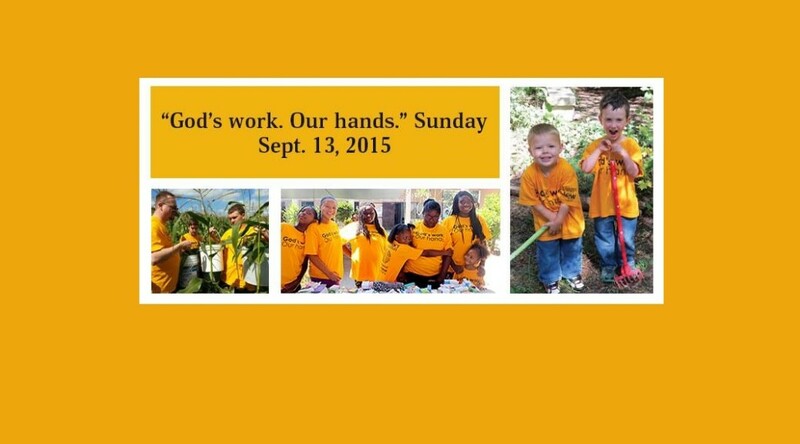 Wear or plan to purchase a “God’s Work, Our Hands” t-shirt to wear for this day of service together. The blood mobile will be here again this year-blood donors sign up for this opportunity to Give the Gift of Life. Volunteer opportunities include: Ashlynn Althaus’ Girl Scout Silver Award project at Gethsemane Park, making toys for the Austin Humane Society in the Multi-Purpose Room, weeding the gaga ball pit area at the Ministry House & Elroy/Moline Lutheran Cemetery cleanup in Elroy. Signup sheets for each these opportunities are in the narthex. Christ The King Sunday concludes the church year. 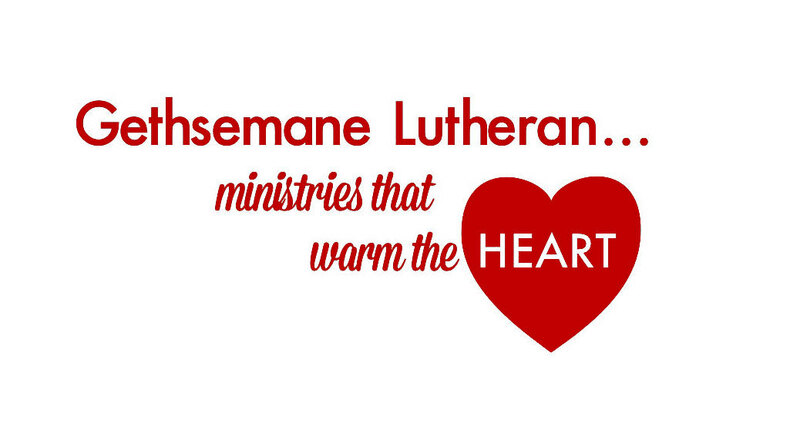 This is the time for the Gethsemane community to look to the past giving thanks for faithful stewards and look to the future encouraging every person within the Gethsemane Lutheran community to make a pledge commitment for 2016 ministries. Please come and share in this time celebrating ministries of the congregation and renewing commitment to 2016 ministry. Everyone is needed! Everyone has talents, time and treasure for ministry. September 13th is Kick-Off for the Sunday morning and Wednesday evening Educational opportunities at Gethsemane. All ages are invited to the MPR at 9:30 a.m. to meet teachers, hear a story, sing songs, and celebrate the beginning of a new year of growing in faith. Welcome Back Blue Bell Ice Cream Sunday. 2015 was the first Vacation Bible School the VBS children did not have a Blue Bell treat – Rally Sunday will offer Blue Bell ice cream to everyone participating in the Rally Sunday meal. Thanks to Stephen & Jane Jaster Greinert and Pastor Karl & Sharon Hendrickson Gronberg for providing the ice cream for the enjoyment of everyone – great to have Blue Bell back ! There will also be 3 sets of ribs auctioned off so bring your checkbooks. The afternoon will be an opportunity for Gethsemane congregants to reaffirm ministry to the neighborhood. This will be a multi-generational opportunity for service work restoring/reconciling communities. “God’s Work, Our Hands” t-shirts will be available for purchase to wear for this day of service together. Volunteer opportunities include: Moline Lutheran Cemetery clean-up; Georgian Acres Community Garden and Lola Drive clean-up; make toys for the animals at the Austin Humane society; shop for supplies helping a family through Refugee Services of Texas; a book drive for Gethsemane Lutheran Children’s Ministry; the annual blood drive provides an opportunity for Gethsemane congregants to “give the gift of life”.. Many opportunities to make a difference in the community. 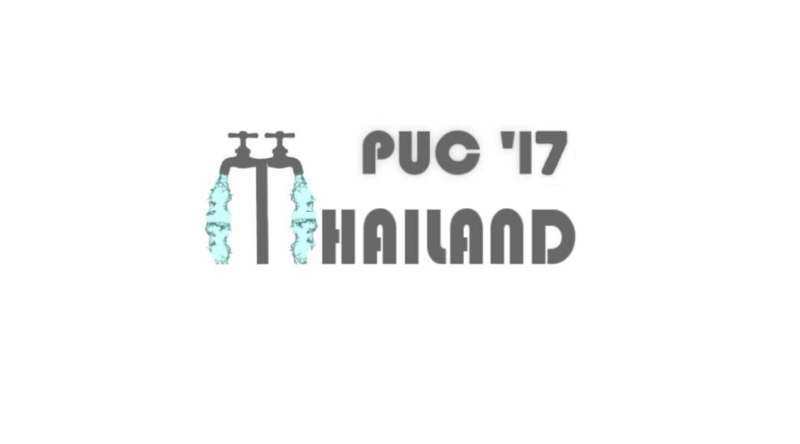 Thanks to Babs & Mihira Chandrasoma for coordinating these service opportunities. God’s Work, Our Hands. Sacramental vessels-chalice and bread plate–purchased by Gethsemane youth at the Detroit ELCA National Youth Gathering – as a gift to the congregational will be dedicated and used for the first time on “God’s work, Our hands Sunday. Thanks to Gethsemane youth for continuing this tradition giving a generous gift for the worship life of Gethsemane Lutheran expressing their gratitude for the support Gethsemane gives to youth ministry. Godly Play Quilt designed by 2014-2015 Gethsemane intern Sharolyn Swenson Browning and quilted by Arlene Beckham Smith with assistance from the Gethsemane quilters depicts the liturgical church year. This 8’x8’ quilt will be dedicated Sunday, September 13 during the worship of the Gethsemane community for use in the new Godly play room and at the Kid’s Table. Thank you Gethsemane women for your work in creating this beautiful quilt story of the grace of God. 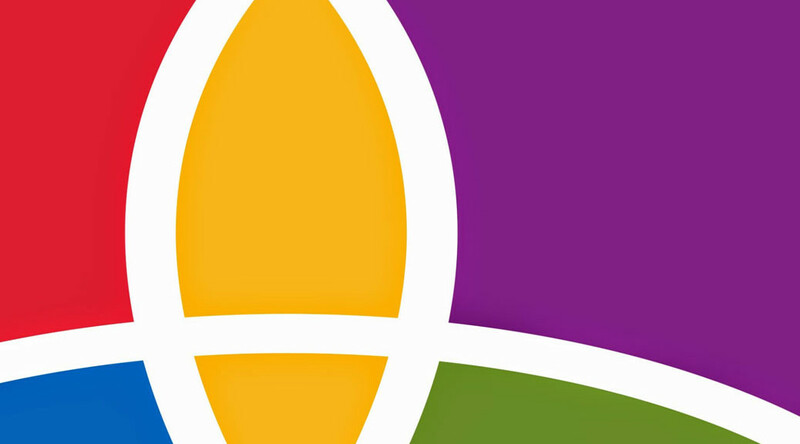 I want to be a Reconciling Lutheran! People of every age, class, color, and ethnic origin…. People of all sexual orientations and gender identities…. People who are single, married, divorced, separated, blessed or partnered…. People who are temporarily-able, disabled, or of differing abilities…. And we ask God, the giver of life and all creation, to guide our ways in living out the ministry of reconciliation always seeking to follow in the steps of Jesus Christ.